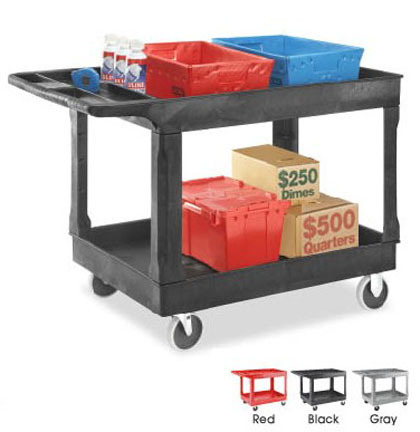 These bank vault utility carts are built tough in the USA and ideal for use in the vault, stockroom or office. They are constructed of sturdy structural foam, with rounded edges to prevent wall damage, plus they are lightweight and easy to maneuver in tight spots. The 2-5/8" deep trays are 19" apart. The 5-inch, quiet rubber casters are non-marking; two rigid and two swivel. Avalaible in two sizes. Model USH2503 is 40" L x 18" W x 33" H. Model USH2504 is 45" L x 25" W x 33" H. They are easy to assemble and ship UPS at a flat rate of $22.50 for either model. These bank vault utility carts are built tough in the USA and ideal for use in the vault, stockroom or office. They are constructed of sturdy structural foam, with rounded edges to prevent wall damage, plus they are lightweight and easy to maneuver in tight spots. Available in two sizes.